Follow your interest with the help from Google (google alerts) !!! There is something which interests you and always want to be updated with the latest information around that interest. The interest could be anything!!! It could be a product (say HTC mobiles, Samsung TV, car, or anything), an organization (e.g. yahoo, tata, google, etc...) OR even a human being like PM of a country, a states man or your friend or even your self!!! And want to be updated with any new info around it as it floats on web. 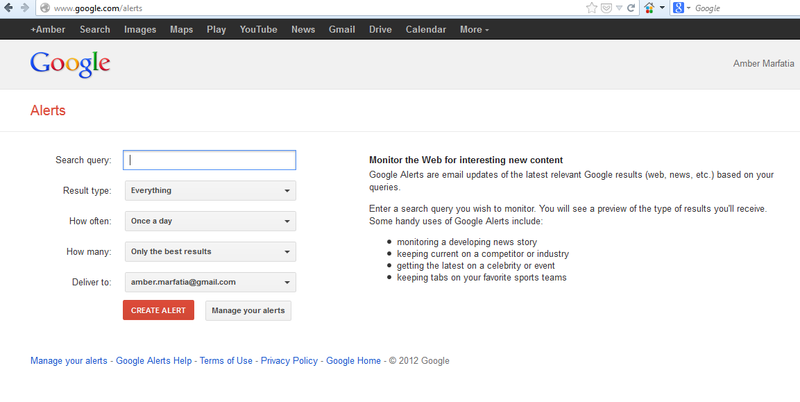 Google Alerts only provides content from Google's own search engine. Users determine the frequency of checks for new results. Three options are available: "once a day", "once a week", or "as it happens". These options set the maximum frequency of alerts and do not necessarily control how often they will receive alerts. Alerts are sent only if new content matches the user-selected search terms. The first option, for example, means they will receive at most one alert email per day. The "as it happens" option can result in many alert emails per day, depending on the search. Google Alerts are available in plain text as well as HTML. In October 2008 Google also made alerts available as RSS feeds. • find out what is being said about their company or product. • monitor a developing news story. • keep up to date on a competitor or industry. • get the latest news on a celebrity or sports team. • find out what's being said about themselves. And its usage could be any thing from following or anything imaginable!! • If you have a common name, you can use negative terms to remove irrelevant results. For example, if you have the same name as a professional football player, try adding -football to your query. Example: [ "Joe Bloggs" -football ]. • If you get a lot of results from a site that you aren't interested in, you can exclude results from that site. For example, if you don't want results from twitter.com, add [ -site:twitter.com ] to your query. Example: [ "Joe Bloggs" -site:twitter.com ]. • If you only want results from newspapers, change the "Type" field from "Everything" to "News". • If you want more results, use the "Email length" field to increase the number of results in each email.